Kate Kaplan is the Director of Development and Alumni Relations for the Heller School at Brandeis University and the former Chief Advancement Officer of Two Ten Footwear Foundation. 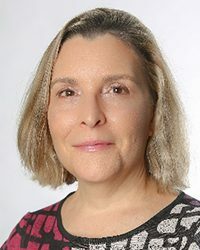 Her previous work experience includes: Marketing and Development Director, Jericho Road Project; Nonprofit management and board development consultant, Kaplan Associates and Fortunato Consulting Group; Director of Program Development and Department Administrator, Urban and Environmental Policy, Lincoln Filene Center and the Graduate School, Tufts University. Kate received an M.A. in Urban and Environmental Policy from Tufts University in 1995, and a B.A. in Sociology-Anthropology from Oberlin College in 1986. She and her family reside in Concord, Massachusetts. Her daughters, Sophia and Elise, are in the classes of 2020 and 2022, respectively. Kate was elected to a five-year term as Alumni Trustee by the Alumni Association in April 2017. She began her term on the Board of Trustees on November 4, 2017.